Colored Responder Holster Set Black. Deluxe Recuse Holser Set. This holster set comes fully stocked with Emt shears 7.25" stainless steel, 1 Kelly Forcep 5.5" straight, 1 Bandage Scissors 4.5" 1 seat belt cutter with pocket clip, 1 penlight ( disposable), 1 Window punch. 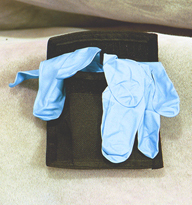 Glove Pouch holder with two pairs of large latex free nitrile exam gloves. Jr Responder Holster Empty Verticle. This holster fits easily on a belt loop and is light to carry around with essential EMT Instruments. Jr Responder Holster Empty Horizontal. This holster is light to carry on your belt loop and holds all essential Instruments and a penlight. Needi First call Holster Black (Empty) Holster has Nylon velcro belt loop ,up to 7 pockets inside ,velcro closure flap with reflectors & glove pouch pocket in the front. 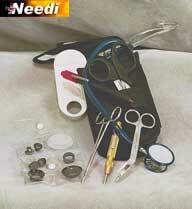 Needi First Call comes with reflectors and velcro closure two front pockets and hip belt loop. 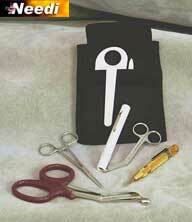 This Holster set is Filled with the following: Single tube dual head latex free 22" long tube stethoscope, Reusable penlight, kelly Forceps 5.5" straight ,stainless steel, Lister Bandage Scissors 5.5" stainless steel, Window Punch with pocket clip, Seat Belt Cutter, Emt Shears 7 1/2"